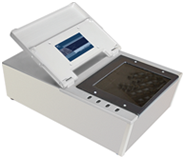 Fingerprint and palm print devices use the high-definition optics that allow the capture of forensic-quality rolled or flat images that meet the ANSI/NIST and FBI Image Quality Specification (IQS) standards for live scan fingerprinting. 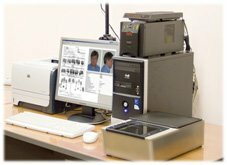 Fingerprint and palm print images produced by live-scanning with the 500 ppi resolution fully comply with the FBI’s IAFIS Image Quality Specification: CJIS­-TD­-0110; CJIS­-RS­-0010 (v. 7) app.F. Sensing platens of the fingerprint AFIS scanners are of a size ample for imaging full, not truncated, impressions even of large hands. Designed for capturing rolled and plain fingerprints and palm prints (including the so-called 'writer's palms'), this device provides best-in-class quality and functionality. 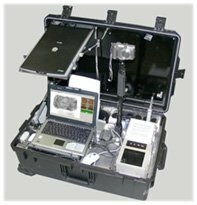 Compliant to the FBI's "IAFIS Image Quality Specification"
Compact and ergonomic DS-30N uses optical technology that enables producing high quality fingerprint and palm print images even of moist fingers and palms.